Abu Dhabi is is the capital and the second largest city of the United Arab Emirates. 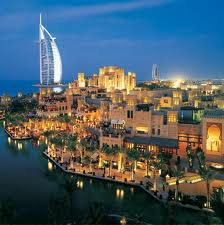 It is located on the Persian Gulf, and had an estimated population of 896,800 in 2009. Fortune magazine has stated that Abu Dhabi is the richest city in the world. The fabulous wealth of Abu Dhabi is based on the extraction of oil. It is, essentially, at least as I understand it, largely a "family" enterprise. The wealth, and the governmental power created by that wealth, is largely under the control of the Abu Dhabi Emiri Family. An interesting fact that I gleaned from an article in the November 15, 2011 edition of The Wall Street Journal is that the government of Abu Dhabi is moving to become a major investor in the ownership of the EMI Group, which holds the publication rights to massive amounts of music. Somehow, this story made me reflect upon the strangeness of a human-created reality that has allowed the the world of Nature to be transformed into money, controlled by an amazingly small number of individuals, who now claim not only physical territory as the spoils of their conquest of wealth, but what might also be called the "spiritual" legacy of our civilization. Listening to music is, in fact, how many of us connect to what could be called the "spiritual" dimension of our lives, taking us beyond the physical realities that constrain our existence. In the future, to hear the music, we will be paying a toll to the Emirates. All these human arrangements, of course, can actually be changed. I think that is what that 99% movement is all about.